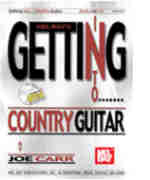 In this comprehensive study, Joe Carr presents all the major country guitar styles in tablature and standard music notation. Beginning with basic chords and strum patterns, this book/CD combination covers flatpicking, fingerpicking and the major country lead styles including Rockabilly, Swing and modern electric. Special sections explain The Nashville Number System, string bending and beginning lead guitar. More experienced players will find a wealth of new material in the sections on lead, scales and chords, crosspicking, harmony and even a tele-style banjo imitation! Accompanying CD includes all music.